Silene vulgaris maritima with a little water and some sun is a real show. The inflated calyx and white bloom work well with the soft gray foliage. The primary season is the spring but a smattering of blooms are almost always there. Silene vulgaris maritima usually looks miserable in the container. I have grown this in fairly dark situations and still otten a great bloom. 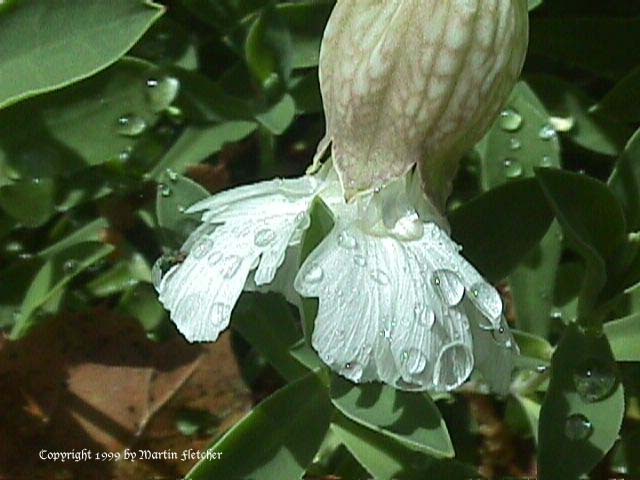 Silene vulgaris maritima will take a fair amount of drought but prefers a regular drink. Excessive overhead water can cause the stems to rot. Silene vulgaris maritima often regenerates itself from seed after conditions have become to harsh. I have not had any damage due to cold weather. White flower and inflated calyx of Silene vulgaris maritima - Sea Campion.